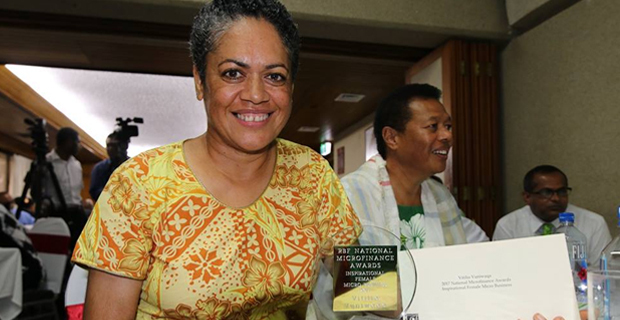 Vitilia Vuniwaqa who suffered a stroke in 2010 but recovered and started her own business was one of 19 small business entrepreneurs that received an award at the 2017 National Microfinance Awards that was held at the Reserve Bank of Fiji. Vuniwaqa got the Inspirational Female Micro Business award. She was a former flight attendant for Fiji Airways until she suffered a stroke in 2010 and now she manages an organic and cash crop farming business from Nadi. She focuses on establishing a good costumer base before expanding her business. Jadish Chand, a 60-year-old retired ambulance driver, now operates his own business known as the Vaileka Funeral Directors in Rakiraki which is the first of its kind was nominated for the individual category of Outstanding business concept. Rajeet Kumara is the owner of a climate control refrigeration which he founded in 2013, and due to the growth of his client base, Kumar has hired additional staff to work for his business. Winner for the young entrepreneur awards, Tatulala Tuinamoala is the co-owner of Faleigh minimart in her home village in Matuku, Lau, and also works towards alleviating Poverty. The Governor General of the Reserve Bank of Fiji, Ariff Ali says that by allowing people to create employment opportunities, it in turns contributes to reducing poverty and improving the standard of living. Ali state that one of the attributes of Microfinance he admires is its ability to empower people.